Take-Two Interactive isn't revealing any sales numbers but is willing to say that it sees L.A. Noire as "another strong franchise" for the company. Rockstar doesn't very often miss the mark. It's best known for the Grand Theft Auto games, for obvious reasons, but pretty much everything it does, it does well. L.A. Noire is no exception and although Take-Two CEO Strauss Zelnick wouldn't reveal whether the game is a Red Dead Redemption or a Midnight Club, he did suggest during the company's fourth quarter earnings call that things are looking good for the game. "We certainly don't want to be subject to [comparing] all of our new releases of new franchises against the extraordiany success of Red Dead Redemption. Every title stands alone. 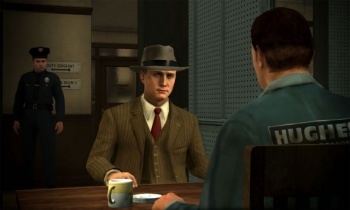 We have every reason to believe L.A. Noire is another strong franchise for this company," Zelnick said. "No matter how you slice it, it's a very successful release," he continued. "To be able to say that again is extraordinary. This management team is just immensely grateful to Rockstar for delivering another superb title and 2K [Games] for all the franchises they've been delivering as of late. One can never take that for granted. The hit ratio of this group is extraordinary." One-offs are a relative rarity in the industry today so while a game doesn't have to be a super-smash hit to earn a sequel, calling it a "powerful new franchise" as Zelnick did does suggest that it's doing at least reasonably well. That's not exactly a surprise given all the positive conversation that L.A. Noire has churned up over the past week, and while not every great game needs a sequel [I can think of one Take-Two game in particular that fits that description], I don't imagine that too many gamers will be unhappy with the thought of more Noire.